Before this past weekend, it had been almost two months since I’d ventured to the outskirts of Santiago, taken advantage of the many surrounding mountains and hiked! That may not seem like a very long time to you, but for me, it seemed like a lifetime. Santiago is pretty much completely encircled by mountains and this winter has been particularly mild- so I really have no excuses. Living down here in South America (with a new roommate who is quite the hiking enthusiast- hey Kait! 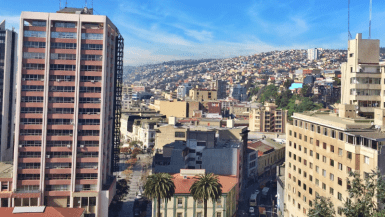 ), I’ve really enjoyed escaping busy, smoggy Santiago on the weekends and getting in some exercise while breathing in some fresh air, which happens to be pretty rare in these parts. So, anyway, long story short- with a warm sunny Sunday on the horizon, it was time to get back out there. 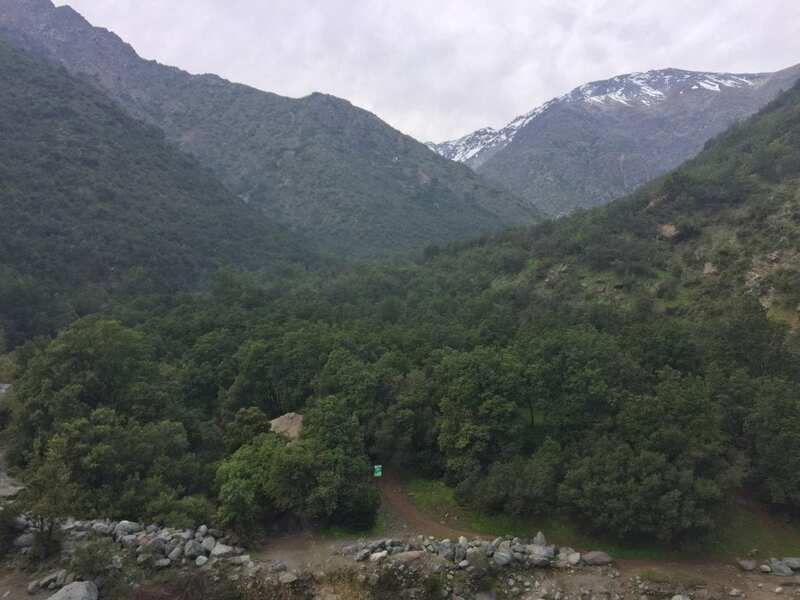 If you’re a regular around here, you may have already seen my other “Santiago Day Hikes” posts about Cerro Manquehue and Cerro Pochoco, two “cerros” (hills in Spanish) that I tackled last year while preparing to do the 5-day Salkantay Trek in Peru. I’d consider both of these “hills,” (if you can call them that- they’re pretty huge!) fairly difficult ascents. You even have to climb a bit and scramble at parts. They’re doable, but definitely a feat for a new hiker. I was in pretty good shape at the time I took them on, but like I said above, I hadn’t hiked in a while, so I thought maybe this time we’d go with something on the easier side. That brings me to La Quebrada de Macul. Parque Natural Quebrada de Macul is located in the Southeastern sector of Santiago in Peñalolén, just a short 30-minute drive or 45-minute ride on public transport from downtown. It’s one of the closest and easiest parks to access in the mountainous area surrounding Santiago and makes for the perfect day outing. 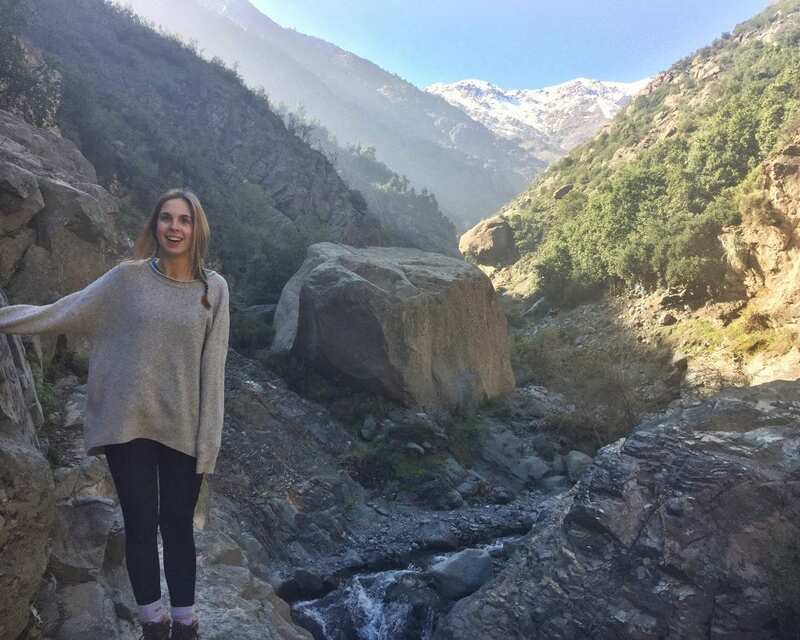 With a fairly easy-to-follow trail, it’s family and “new-hiker” friendly and is a great Santiago introductory hike. 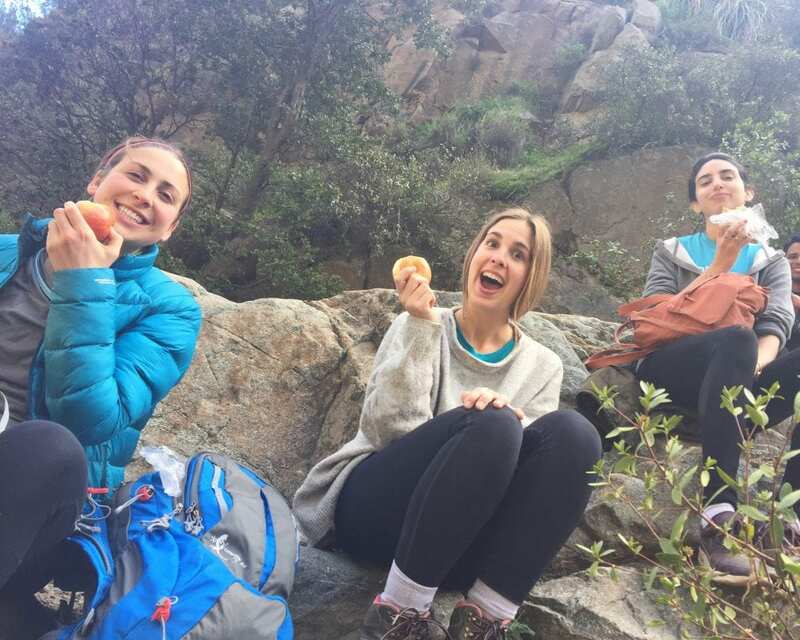 Not to mention it ends at a waterfall, which makes for the perfect picnic spot! 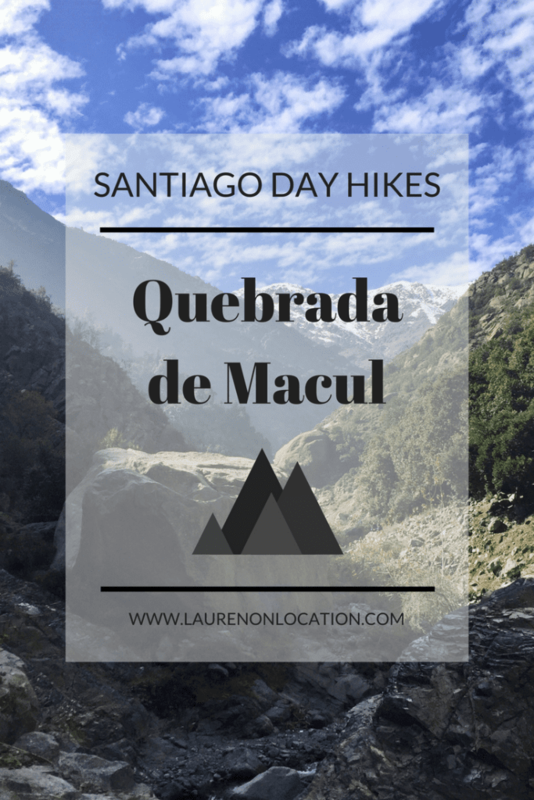 Quebrada Macul was really easy to get to compared to other hikes I’ve done in the Santiago area and reachable by only use of public transport. Even though you have to check in with the Park Rangers before beginning this hike, you don’t have to pay a fee to enter. 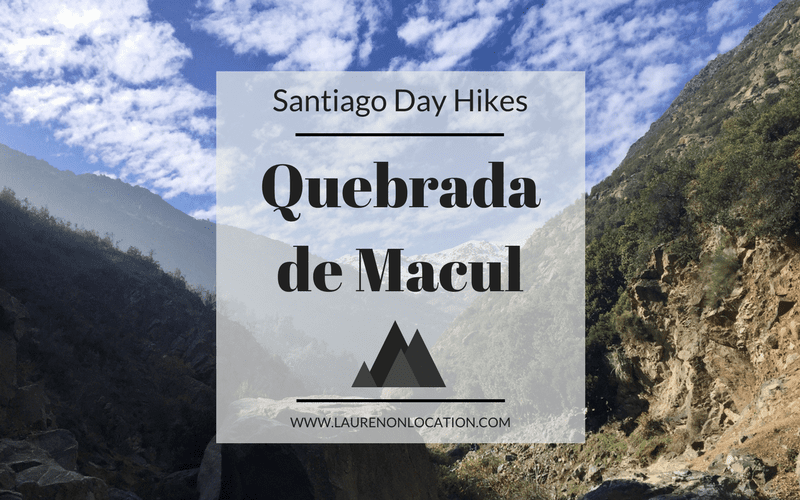 Quebrada Macul is a hike that you can do year round. I’d say the ideal time to go would be spring or fall for temperature’s sake, but here I am in the middle of winter, and we completed the hike just fine. In fact, it was about 60F the day we went. On the other hand, in the summer this trail will most likely be pretty hot. 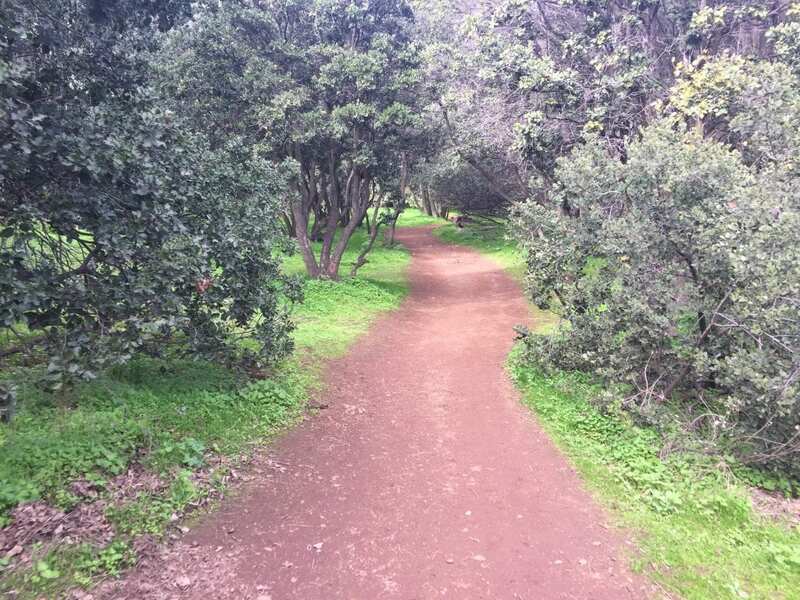 Still, unlike other hikes in the Santiago area that are very exposed, Parque Natural Quebrada de Macul is very green which provides a decent amount of shade. The trail to the waterfall, depending on your physical condition, will take you about 2 hours. To descend about an hour. The trail to the waterfall was a bit steep in some areas, but for the most part was pretty flat and very easy to follow. There was only one way up and one way down, and there were plenty of other people on the path as well as some trail markings. In my opinion, compared to hikes like Cerro Pochoco and Cerro Manquehue, I would say this trail is way easier and should be doable for anyone in decent physical shape. Hiking Boots– I had a few friends who did this trail in trainers, and they were fine. Still at some of the steeper, slippery parts, they commented on my hiking boots, wishing they had come more prepared. Sunscreen– Although this park offers a good amount of shade, part of the trail is in direct sunlight. I didn’t go equipped with sun tan lotion (comeon, middle of winter) and ended up returning home with tender pink cheeks. 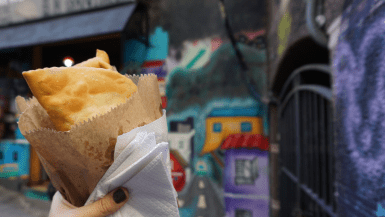 Food for the day– Once you get into the heart of Peñalolén, you will find some small neighborhood markets and sweet stands along the street, but if you’re looking to have lunch at the waterfall, or are particular about what you’re eating- bring snacks for the day. Do you like to hike? If you lived this close to mountains, would you take advantage? I’d love to hear from you in the comments below! Consider yourself a wanderer?! Well then, this Blog Hop is for you! Meet your hosts: ME, Lauren of Lauren on Location, Van of Snow in Tromso, Isabel of The Sunny Side of This and Marcella of What a Wonderful World. Here on Wanderful Wednesday we hope to promote an open and supportive community for like-minded bloggers- expats, travelers and all kinds of wanderers! The linkup will take place every Wednesday at 8AM GMT. Link up a wanderful travel related post below! One per blogger per week please! Spread the LOVE! Blog Hops are all about hopping around & getting to know others within the community! At the very least please try to comment on one other post before you go! Don’t forget to grab the button and link back to your wanderful hosts! Help us spread the word and let’s get others involved! You can also pin your post to our new Pinterest Board! Let me know if you’d like the invite. This week I’m highlighting How to Stay Focused when everyone else is going on Vacation by Candace! I’m currently feeling the Southern Hemisphere winter blues while everyone back home is enjoying summer Fridays and soaking up the warm summer sun. Needless to say, it’s been pretty hard to focus at work. (Especially with all the clouds and rain we’ve had lately.) SOOO, if you haven’t already, be sure to go check out her post and spread the love! Thanks for linking up with us Candace! ? What a great hike! You all look like you had so much fun together. I love a good hike, as long as it’s not too crazy-difficult. Ok, when can I go?! This hike looks GORGEOUS! And I’m with you. Two months without getting up into those mountains would feel like forever to me too. Lucky you having that on your doorstep! Yay, I need to add this to my list! I actually haven’t heard of this one 🙂 Thanks for sharing! I better get myself in a bit better shape for the steep parts. one way up and down I can handle. We are headed to Santiago later in the year. I can’t wait. I love seeing you on video! You’re too cute and you and your friends seem really fun! I love when there are nice nature spots to escape to from the city. This definitely looks like a hike I can do, even though I’m in terrible physical shape!